(From Foxnews.com) – “Convert. Submit to Islam. 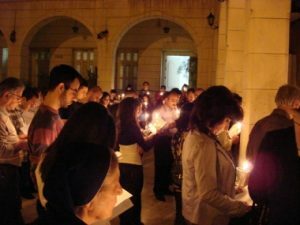 Or face the sword.” In recent days, the besieged Christian community in Raqqa, a city in northern Syria, has faced those three stark alternatives. The terrorist group known as ISIS (the Islamic State of Iraq and the Levant) made their demands after seizing control of the region. They required the local Christians to renounce their faith and embrace Islam, assent to extreme subjugation or face death. In Syria and in Egypt, in Libya and beyond, Islamist attacks on Christians happen every day. On Feb. 27, ISIS published a statement that an agreement had been signed by 20 of Raqqa’s Christian leaders. Faced with losing their lives or denying their Christian faith, the community opted for dhimmi status – suppression as a “protected” minority – which requires them to submit to an array of demands, including the notorious jizya tax, which can be compared to Mafiosi protection money: purchasing their safety, but under strictly enforced regulations. Raqqa’s Christians are now subject to an extreme version of sharia (Islamic law), which among other things forbids them to repair their war-torn churches, worship or pray in public, ring church bells, or wear crosses or other symbols of their faith. Bearing arms is, of course, forbidden, as are alcoholic beverages. Even before the agreement was signed, on Feb. 22 Lebanon’s Daily Star reported, “ISIS has imposed a strict form of Islam in Raqqa, enforcing the veil and banning cigarettes. They have doled out harsh punishments under sharia courts for religious crimes, including beatings and executions. In Al-Bab, Aleppo, pictures showing ISIS fighters burning tons of cigarettes were recently published.” The Christians of Raqqa chose “to sign the dhimma treaty over war,” the ISIS statement explained, and in return received a commitment by local ISIS commander Ibrahim Al-Badri – also known as Abu Bakr Al-Baghdadi – that they would not be subjected to physical harm or religious targeting once the treaty was approved. This subjection of Christians and Jews to dhimmitude has a long history in the Middle East and throughout the greater Muslim world. Although it officially ended after the demise of the Ottoman Empire, its humiliating and unequivocal demands have never been erased from the behavior patterns of communities that suffered under it. And in various ways it is still enforced de facto in some modern Muslim states. But in today’s Syria, where war-like militias compete to wield power, enhance prestige and impose piety, the command to convert or die is a familiar threat. And although dhimmi status may save lives temporarily, it is null and void if protection money isn’t paid or if the local authorities are somehow offended. Although Syria’s Christians face exceptional dangers, they aren’t alone in their misery. 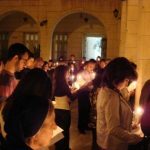 In recent days, other Christians have also been violently attacked in the Middle East. On Feb. 16, three Korean pilgrims and an Egyptian Christian bus driver were killed and more than a dozen injured in a suicide bombing as they drove across the Sinai Peninsula. Malaysia’s New Straits Times reported, “The bus was carrying 31 parishioners from Jincheon Jungang Presbyterian Church, which is south of Seoul, and was attempting to travel from Egypt into Israel … the church had long saved money to commemorate the 60th anniversary of its founding with a trip to Biblical sites.” Ansar Bayt al-Maqdis, an organization affiliated with Al-Qaeda, has claimed responsibility for the attack. In Libya, on Feb. 24, terrorists went door to door in a Benghazi apartment building, asking residents whether they were Muslim or Christian. Seven Egyptian Coptic Christians were seized, taken to a beach and summarily executed – each one shot in the head. An eighth Christian escaped and reported the crime. The outraged Coptic Church in Egypt has demanded further information and the arrest of the terrorists. In Syria and in Egypt, in Libya and beyond, Islamist attacks on Christians happen every day: rapes and kidnappings, maiming and murders, houses burned down, churches blown up. Recently in Nigeria, Christians have been massacred by the hundreds. It’s so pervasive and so constant that our minds struggle to believe it. Can you imagine a gang of hateful, heavily armed terrorists showing up at your door? Your terrified family is with you, and maybe a few friends. An angry spokesman orders all of you to choose – at gunpoint, then and there – to convert to Islam, surrender, or die. Believe it or not, it’s an ever-increasing scenario. In fact, in some form or other, it’s probably going on somewhere right now. Lela Gilbert is author of “Saturday People, Sunday People: Israel through the Eyes of a Christian Sojourner” and co-author, with Nina Shea and Paul Marshall, of “Persecuted: The Global Assault on Christians.” A resident of Jerusalem, she is an adjunct fellow at the Hudson Institute. Her website is www.lelagilbert.com, and she can be followed at Twitter@lelagilbert.